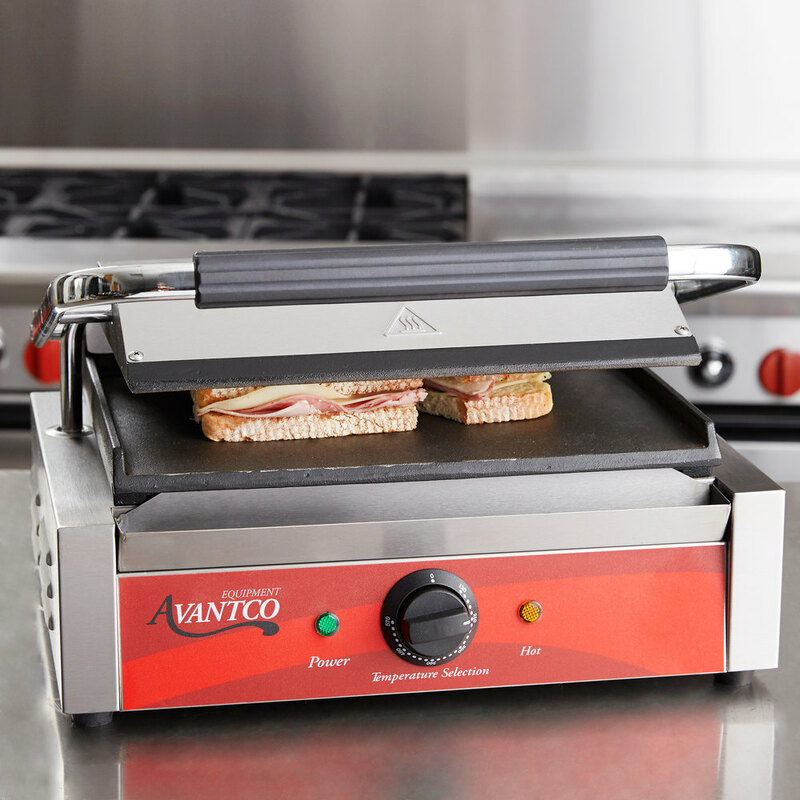 Create your most popular sandwiches, quesadillas, hamburgers, and more with the Avantco P70S smooth commercial panini sandwich grill! 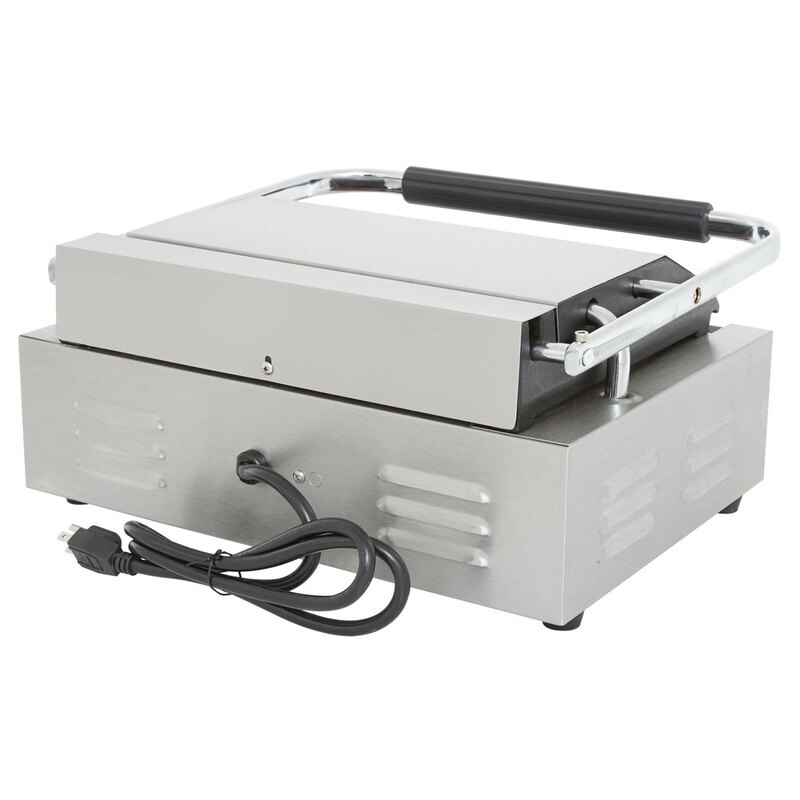 This sandwich grill features 1750 watts of heating power for fast and thorough cooking, and its smooth 13" x 8 3/4" grilling area ensures complete contact with your product and consistent, even heat supply. The temperature is easily adjustable between 120 and 570 degrees Fahrenheit to cook or warm a wide variety of foods, while the stainless steel exterior and cast iron plates ensure long-lasting durability and strength. And thanks to the included drip tray, cleaning up is a breeze after every use. 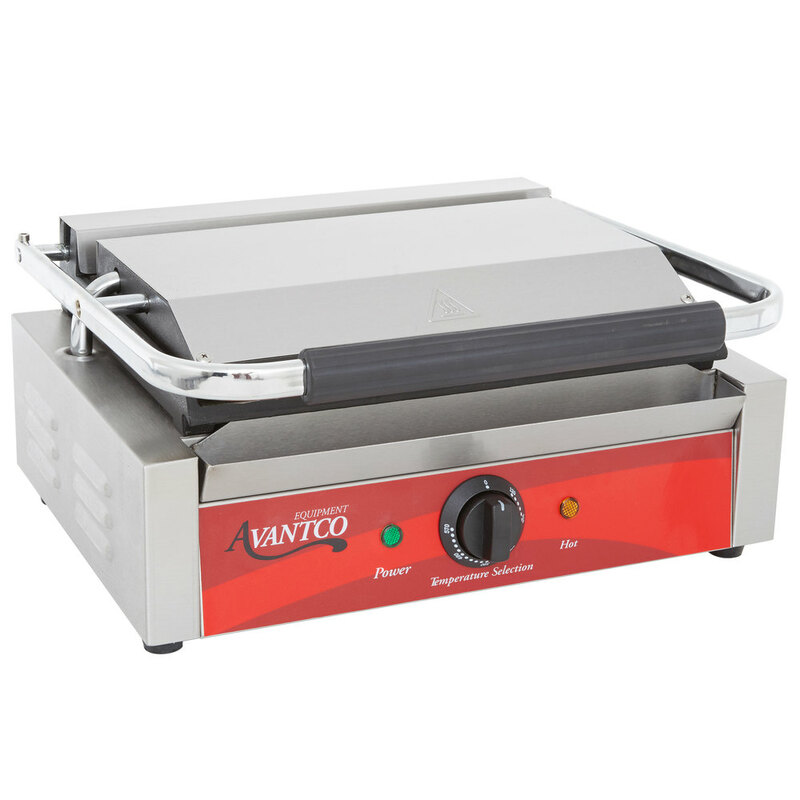 I did a fair amount of research on brands and price for a commercial panini grill w/ smooth plates and this was the winner. This model has performed very well so far (a month in). I will likely purchase the grill cleaning kit w/ it's grill scraper as it's otherwise difficult to keep the plates clean and free of burnt residue. I love this panini press!! It keeps up with my busy business and cooks evenly and perfectly. I went for the smooth too and bottom plates because grill marks are over rated and harder to keep the grill clean. I make perfect sandwiches every time! Heats up fast and gets hot. The only complaint I have is upon arrival there was a noticeable spot on the cast iron bottom griddle and upon seasoning it looks well worn now. Seems to get hotter in that spot. 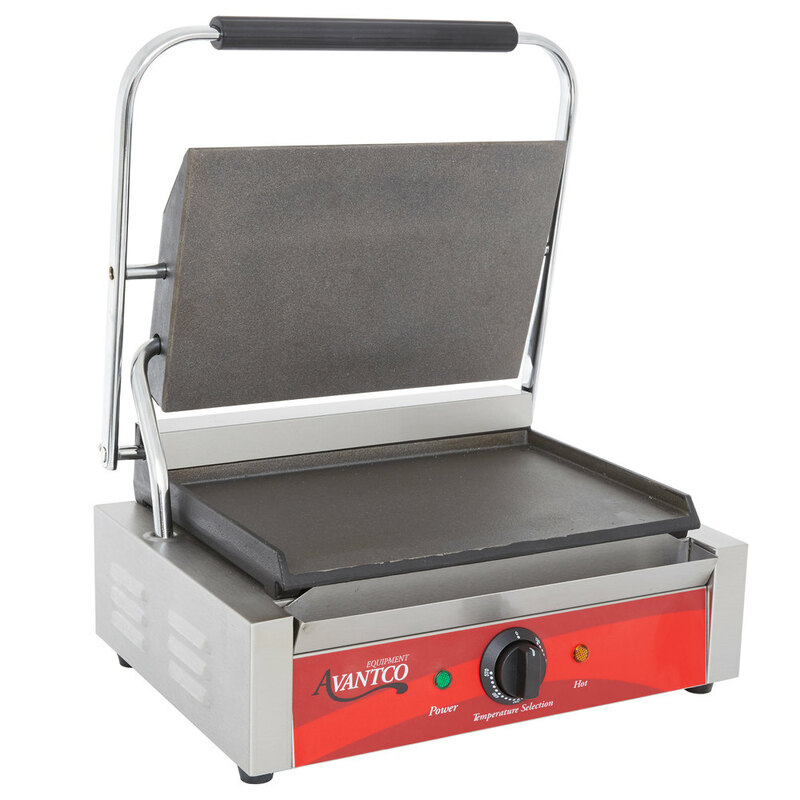 This is a great working panini sandwich grill. The price is fantastic compared to the other brands and other merchants. We run this machine from morning till night and has worked wonderfully. This is a great product and brand. I know several other restaurants that use this in the county. Great price point on top f it all. Went shopping at two local supply houses here in Las Vegas, neither of them had any sort of "selection" when it came to sandwich presses, and the ones they had were only grooved panini style. Happy to have somewhere to purchase what I want, not choose from what they have. I have had mine for 3 years now and NEVER let me down. People said I should buy a more popular brand so it would not break down on me. Dont believe it! These work great! Had this thing for a few month's now.. It has worked like a champ so far. Easy to maintain, even heating once it has been on for a while. Really my only complaint, and it's a small one that I haven't heard others voice, is that when you raise the handle you have to hold the machine down with one hand or it will tilt backwards since the (pneumatic?) arm that helps support the weight of the top is a bit too stiff. There may be a way to adjust that, I'll admit to not having tried as I would hate to mess it up. Murphy's law is strong within me. 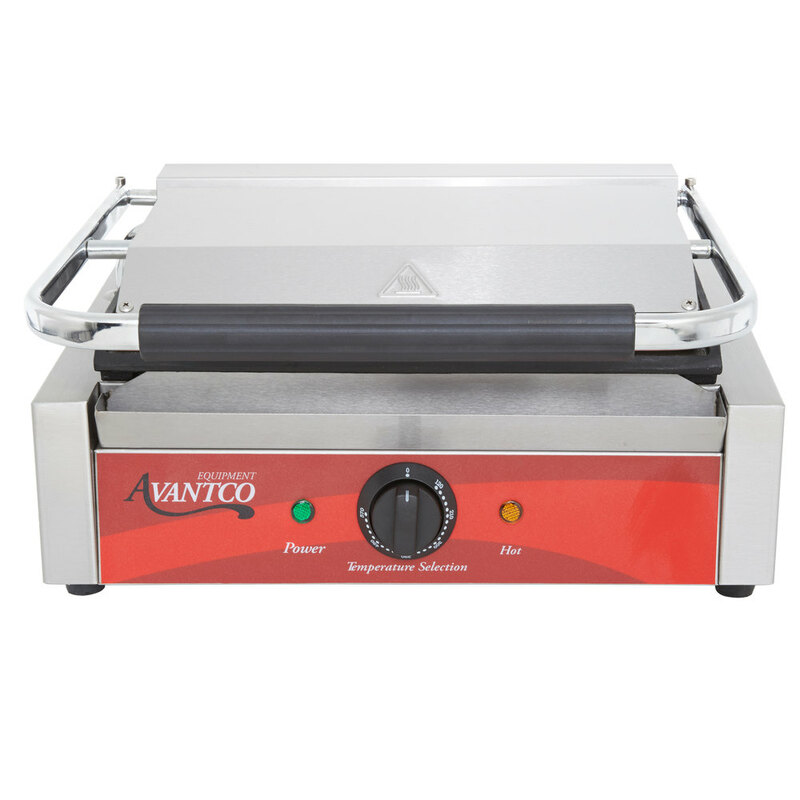 The Avantco P70S Smooth Commercial Panini Sandwich Grill is an amazing resource especially considering the more than reasonable price point. I’ve been needing a panini press for several years but I didn’t want to spend money on a store grade model. Once I came across this model I knew I had to buy it and after only a couple of weeks of use I must say that I am far from disappointed in its performance and effectiveness. I can not say enough good things about this grill. We love it and use it daily. We've been able to expand our menu since we added it to our kitchen. Unit works very well. Be sure to have the proper amperage to run more that one at a time. Works best on separate circuits but this to be expected with any unit. Heats quickly and evenly. It does lean a bit toward the back so it presses more evenly if you are sire to balance the top before pressing. Overall a solid unit. Cleans easily but the thickness of the cast iron concerns me enough that I would not use metal utensils on this. It is holding up very well with plastic spatulas with no signs of wear.